Established in 1983, Dickens Carolers® is a unique holiday season entertainment company providing professional Christmas caroling quartets for any venue or occasion throughout the metropolitan Phoenix area. All performers are trained by us to insure the on-time, consistent, quality performances that our customers have come to expect. Quartets consist of two women and two men dressed in authentic Victorian era attire created exclusively for Dickens Carolers. Dickens Carolers® are appropriate for any type of event, including business functions, luncheons, office or private parties, Christmas season birthdays, weddings, anniversaries, tree lighting ceremonies, office lobbies, senior centers, retail stores, shopping malls and resorts. 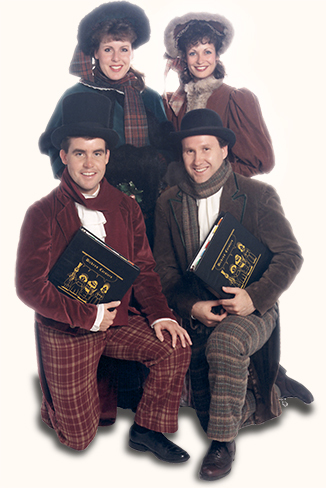 Reserve your Dickens Carolers® quartet today by calling: 480-994-3666.